Giant Kelp (Macrocystis pyrifera). Photo by Claire Fackler. Courtesy of NOAA. Kelps are large seaweeds in the order Laminariales that form dense canopies in temperate rocky intertidal and subtidal habitats less than 30 m in depth. The kelp flora of the Pacific Northwest is one of the most diverse in the world (Druehl 1969). Kelps are characterized by a highly dimorphic lifecycle consisting of a large diploid sporophytic (bed-forming) phase and a microscopic haploid gametophytic phase. In the Puget Sound region, bull kelp (Nereocystis luetkeana) occurs throughout Puget Sound and the Strait of Juan de Fuca, while the distribution of giant kelp (Macrocystis integrifolia) is restricted to the Strait of Fuca (Berry et al. 2005, Mumford 2007). Both form conspicuous floating canopies, or kelp beds. Sporophytes of Nereocystis are annual or semi-annual, whereas sporophytes of Macrocystis are perennial, persisting for several years. In addition to these dominant bed-forming taxa, numerous species of understory (non-floating) kelp occur in subtidal habitats, many of which are present in southern and central Puget Sound (Mumford 2007). Kelps are important primary producers. They contribute to Puget Sound food webs by providing food for herbivores and detritivores, and by releasing dissolved organic carbon (Duggins et al. 1989). In addition, kelps create important biogenic habitat that is utilized by fish, invertebrates, marine mammals, and birds (e.g., Ojeda and Santelices 1984, Graham 2004). Kelp can significantly alter the physical environment by modifying current and wave energy (Eckman et al. 1989) and this buffering capacity can influence the ecology of other organisms that utilize kelp environments for larval dispersal and settlement, for example rockfish (Carr 1991). The extent and composition of kelp beds varies through time in response to natural and human-induced influences. In general, the distribution of kelp is determined by the amount of light available for photosynthesis, nutrient levels, grazers, physical disturbances, and toxic contaminants (reviewed in Mumford 2007). In addition to these external factors, demographic structure may play an important role in driving temporal dynamics of Macrocystis kelp beds through decreased fitness of older, more inbred populations (Raimondi et al. 2004, Reed et al. 2006). Sea Otter (Enhydra lutris). Photo by Mike Boylan. Courtesy U.S. Fish and Wildlife Service. Sea otters have been shown to be keystone predators in kelp forest ecosystem through their consumption of sea urchins, a major grazer of kelps (Estes and Palmisano 1974). In Washington state, otter populations have been slowly increasing since their reintroduction in 1969 and 1970 (Lance et al. 2004) following their extirpation through hunting in the 1900s. While they are more abundant on the open coast, otters have been observed as far east as Pillar Point in the Strait of Juan de Fuca (Lance et al. 2004, Laidre and Jameson 2006) where they have been shown to consumes a high proportion of urchins (Laidre and Jameson 2006). The potential for sea otters to expand into further into Puget Sound could affect kelp populations through trophic interactions. Furthermore, harvest of urchins by humans may be an important indirect driver of kelp populations in the Strait of Juan de Fuca; Berry et al. (2005) anecdotally observed that historic increases in urchin harvest rates were positively associated with increases in kelp abundances. However, in an experimental study, neither simulated fisheries removals nor simulated otter predation significantly affected the abundance of kelps in the San Juan Archipelago (Carter et al. 2007). In addition to trophic interactions, climate changes associated with El Nino are known to cause short-term declines in kelp populations (e.g., Dayton and Tegner 1984), while the Pacific Decadal Oscillation could be driving changes over longer time periods. Substrate movement, as a result of altered nearshore hydrology and geomorphology, may also influence the amount of available habitat for attachment of kelps (Mumford 2007). Due to their proximity to shore, kelps are likely to be subjected to anthropogenic impacts such as pollution discharge, nutrient influxes from urban and agricultural sources, increased turbidity, and increased rates of sedimentation (Dayton 1985, Mumford 2007). These can alter photosynthetic performance and growth of sporophytes and prevent settlement, growth, and reproduction of microscopic gametophytes. 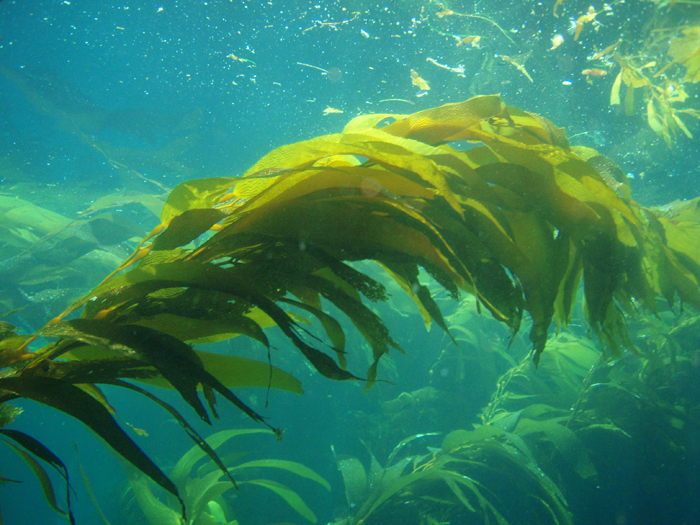 Toxic contaminants such as petroleum products are known to damage kelp by lowering photosynthetic and respiratory rates in meristematic tissue (Antrim et al. 1995). Bull Kelp (Nereocystis luetkeana). Image courtesy of NOAA. The Washington Department of Natural Resources (WDNR) conducts an annual inventory of canopy-forming kelp beds along the outer coast of Washington and the Strait of Juan de Fuca (approximately 360 km of shoreline). Inventories have been conducted annually since 1989 (with the exception of 1993) using aerial color-infrared photography (Van Wagenen 2004). In 2005, Berry et al. (2005) reported a total of approximately 1,700 hectares of floating kelp (Nereocystis and Macrocystis) on Washington’s outer coast and the Strait of Juan de Fuca. Prior to the initiation of annual floating kelp inventories by WDNR, Thom and Hallum (1990) reviewed several sources of historical data and found evidence that floating kelp had increased by 58 percent since the first European mapping in the 1850s. The largest increases were observed in the most populated areas such as central and south Puget Sound, but anecdotal evidence for losses in central Puget Sound were also noted. Between 1989 and 2004, the annual inventories conducted by WDNR for floating kelp at 66 shoreline sections on the outer coast and in the Strait of Juan de Fuca show high year-to-year variation, ranging from 722 hectares in 1997 to 2,575 hectares in 2000 (Berry et al. 2005)(Figure 1). Between the two species of floating kelp, M. integrifolia canopy area was more stable over time than N. luetkeana canopy, potentially due to their differing life histories. From 1989 to 2004, total floating kelp canopy area increased significantly (p<0.01), but these increases were restricted to the Outer Coast and the Western Strait of Juan de Fuca; kelps in the Eastern Juan de Fuca region showed no trend (Berry et al. 2005)(Figure 2). At the smallest scale (5-15km of shoreline), kelp area increased significantly in 18 sections, decreased significantly in 1 section, and did not change significantly in 47 sections (Berry et al. 2005)(Figure 3). A significant decrease in kelp canopy area was detected near Protection Island. Kelp canopies in this area have declined gradually from more than 10 hectares in 1989 and 1990 to less than 1 hectare annually since 1994 (Berry et al. 2005)(Figure 3). Figure 1. Floating Kelp Canopy Area on Washington’s outer coast and the Strait of Juan de Fuca, 1989-2004 (reprinted from Berry et al. 2005 with permission from Nearshore Habitat Program, Washington Department of Natural Resources). Figure 2. Region changes in kelp canopy area (p < 0.01), based on annual surveys between 1989 and 2004 (reprinted from Berry et al. 2005 with permission from Nearshore Habitat Program, Washington Department of Natural Resources). Figure 3. Shoreline sections with significant changes in kelp canopy area (p < 0.01), based on annual surveys between 1989 and 2004 (reprinted from Berry et al. 2005 with permission from Nearshore Habitat Program, Washington Department of Natural Resources). Despite these findings, Mumford (2007) notes multiple anecdotal accounts of kelp bed losses around Marrowstone, Bainbridge, and Fox islands as well as personal observations of the loss of small kelp beds in southern Puget Sound at Itsami Ledge, Devils Head and Dickenson Point. A large Nereocystis bed on Dallas Bank, north of Protection Island in the Strait of Juan de Fuca, has almost totally disappeared since 1989 (Mumford 2007). Other anecdotal observations indicate substantial declines in bull kelp abundance in the San Juan Archipelago and the Strait of Georgia. Taken together, the observations could suggest widespread declines in bull kelp in Puget Sound. The causes of these changes are not known. The long-term WDNR dataset provides important insight into how the aerial extent of kelp canopies has changed over time, yet there may be potential biases associated with this method. Berry et al. (2005) notes that observed trends could be subject to methodological artifacts related to environmental factors (primarily tidal height and current speed) that introduce uncertainty or bias in the monitoring data. Both tides and currents have been shown to affect apparent Nereocystis canopy area as observed by photographs taken from the adjacent shoreline (Britton-Simmons et al. 2008). Consequently, it is possible that some of the observed variation in kelp canopy cover may be inflated by changes in the conditions under which the photographs were taken. The WDNR monitoring programs focuses on the two species of floating kelp (Nereocystis and Macrocystis) native to the region. However, understory (non-floating) kelps are abundant and widely distributed throughout Puget Sound, where their ecological importance could equal that of the canopy-forming kelps. Effective monitoring of subtidal kelp populations is not yet possible, although use of towed video arrays holds promise (Mumford 2007). Furthermore, little is known about the ecology of the microscopic gametophyte phase of kelps due to the difficulty of studying them in situ (Mumford 2007). Failure in settlement, growth, or reproduction in microscopic stages will result in disappearance of the conspicuous sporophytic phases. Kelps are important primary producers and create important biogenic habitat in Puget Sound ecosystems. Annual aerial surveys of floating kelp canopies conducted by WDNR show that between 1898 and 2004 floating canopies increased in outer coastal areas an in the western Strait of Juan de Fuca. Floating kelp canopies in the eastern Strait of Juan de Fuca showed no statistical change over the same period. Anecdotal evidence indicates sharp local declines in kelp abundance in southern and central Puget Sound and the San Juan Archipelago and calls for new investigations and expansion of kelp surveys. Antrim, L. D., R. D. Thom, W. W. Gardiner, V. W. Cullinan, D. K. Shreffler, and R. W. Bienert. 1995. Effects of petroleum products on bull kelp (Nereocystis luetkeana). Marine Biology 122:23-31. Berry, H. D., T. F. Mumford, and P. Dowty. 2005. Using historical data to estimate changes in floating kelp (Nereocystis luetkeana and Macrocystis integrifolia) in Puget Sound, Washington. Puget Sound Georgia Basin Research Conference. Nearshore Habitat Program, Washington Department of Natural Resources, Olympia, WA. Britton-Simmons, K., J. E. Eckman, and D. O. Duggins. 2008. Effect of tidal currents and tidal stage on estimates of bed size in the kelp Nereocystis luetkeana. Marine Ecology Progress Series. 355:95. Carr, M. H. 1991. Habitat selection and recruitment of an assemblage of temperate zone reef fishes. Journal of Experimental Marine Biology and Ecology 146:113-137. Carter, S. K., G. R. VanBlaricom, and B. L. Allen. 2007. Testing the generality of the trophic cascade paradigm for sea otters: a case study with kelp forests in northern Washington, USA. Hydrobiologia 579:233-249. Dayton, P. K. 1985. Ecology of Kelp Communities. Annual Review of Ecology and Systematics 16:215-245. Dayton, P. K., and M. J. Tegner. 1984. Catastrophic storms, El Nino, and patch stability in a southern California kelp community. Science 224:283-285. Druehl, L. D. 1969. The northeast Pacific rim distribution of Laminariales. Pages 161-170 in International Seaweed Symposium. Duggins, D. O., C. A. Simenstad, and J. A. Estes. 1989. Magnification of secondary production by kelp detritus in coastal marine ecosystems. Science 245:170-173. Eckman, J. E., D. O. Duggins, and A. T. Sewell. 1989. Ecology of under story kelp environments. I. Effects of kelps on flow and particle transport near the bottom. Journal of Experimental Marine Biology and Ecology 129:173-187. Estes, J. A., and J. F. Palmisano. 1974. Sea Otters: Their role in structuring nearshore communities. Science 185:1058-1060. Graham, M. H. 2004. Effects of Local Deforestation on the Diversity and Structure of Southern California Giant Kelp Forest Food Webs. Ecosystems 7:341-357. Laidre, K. L., and R. J. Jameson. 2006. Foraging Patterns and Prey Selection in an Increasing and Expanding Sea Otter Population. Journal of Mammalogy 87:799-807. Lance, M. M., S. A. Richardson, and H. L. Allen. 2004. Washington State Recovery Plan for the Sea Otter. Washington Dept. of Fish and Wildlife, Wildlife Program, Olympia, WA. Mumford, T. F. 2007. Kelp and eelgrass in Puget Sound. Seattle District, U.S. Army Corps of Engineers, Puget Sound Nearshore Partnership, Seattle, WA. Ojeda, F. P., and B. Santelices. 1984. Invertebrate communities in holdfasts of kelp Macrocystis pyrifera from Southern Chile. Marine Ecology Progress Series 16:65-73. Raimondi, P. T., D. C. Reed, B. Gaylord, and L. Washburn. 2004. Effects of self-fertilization in the giant kelp, Macrocystis pyrifera. Ecology 85:3267-3276. Reed, D. C., P. T. Raimondi, L. Washburn, B. Gaylord, B. P. Kinlan, and P. T. Drake. 2006. A metapopulation perspective on patch dynamics and connectivity in giant kelp.in J. P. Kritzer and P. F. Sale, editors. Marine Metapopulations. Elsevier Academic Press, Amsterdam; Boston. Thom, R. M., and L. Hallum. 1990. Long-term changes in the areal extent of tidal marshes, eelgrass meadows and kelp forests in Puget Sound, Wetland Ecosystem Team. United States Environmental Protection Agency. Van Wagenen, R. 2004. Washington coastal kelp resources, Summer 2004. Nearshore Habitat Program, Washington Department of Natural Resources, Olympia, WA.